Pita Bread (Unbleached Flour, Water, Oat Fiber, Yeast, Salt, Evaporated Cane Juice), High Monounsaturated Canola Oil and/or Sunflower Oil, Sea Salt Just a touch of sea salt. No cholesterol. All natural. 60% Less fat than leading brands of potato chips. The ultimate dipping chip! We took it all off and let this chip go all natural. Perfect for whatever dip you create or straight from the bag. It was our customers that requested this chip, this one's for you! We both had a passion for good food and healthy living so we left our careers and bought a food cart. We began making healthy pita roll-up sandwiches and at the end of each day we seasoned and baked the pita bread into delicious healthy chips. Before we knew it, Stacy's Pita Chip Company was born. 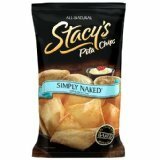 Enjoy Stacy's Pita Chips and feel great knowing that you're eating healthy, baked natural snacks. If you have any questions about this product by stacy, contact us by completing and submitting the form below. If you are looking for a specif part number, please include it with your message.